The temperature is rapidly dropping, the speeders haven't been adapted to the cold yet, and your friend is out there on that glacier somewhere. Sounds like you need a taun taun! 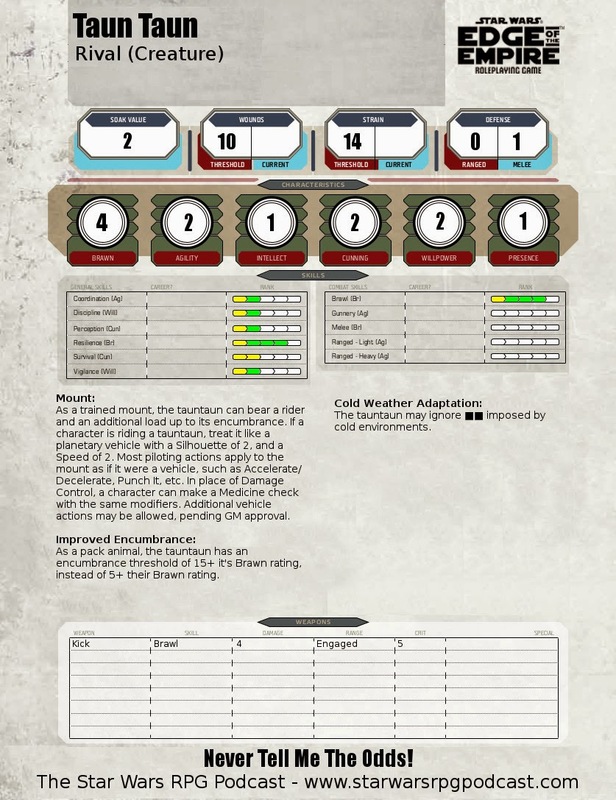 The taun taun stats below feature the new Mount attribute - which allows a player to ride a creature, using the vehicle rules in the Edge of the Empire and Age of Rebellion rule books. A GM should feel free to apply this attribute to any appropriate creature in their campaign to create exciting encounters with/on vehicle sized creatures. For reasons of keeping the rules streamlined, Piloting (Planetary) is the default skill for riding a mount. However, depending on on the situation, or GM's inclination, the Piloting (Planetary) skill could be replaced by Leadership, Coercion, Survival, or even Knowledge (Xenology). The taun taun is a rather modestly sized and modestly paced life form - but there's no reason this attribute couldn't be applied to airspeeder-sized falcons or starship-sized leviathans. Creature Notes: Although a person would have to be truly desperate to try it, the tauntaun's thick pelt and natural insulation can provide a surprisingly effective shelter against severe weather. A character using a tauntaun's body as protection from the elements can gain up to 3 Boost die (■■■) on any Survival or Resilience checks they need to make, although they're likely to smell like rank tauntaun for days to come. Would you be willing to share the template and/or assets that you use to make these sheets? Absolutely! This template is a modified version of OggDude's amazing Star Wars RPG Character Generator program. I've started using some new templates for our other Game Supplements. I'll make them all available in a post in the near future.